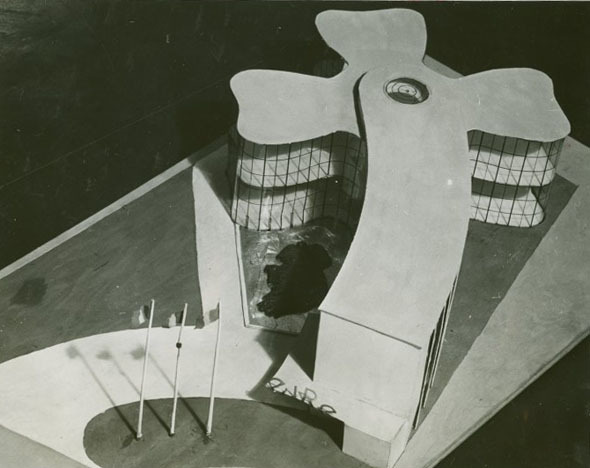 Michael Scott’s most important pre-war commission – the Irish Pavilion for the New York World Fair. This was completed before his final examinations. Scott always had a distrust of academic qualifications and had to be persuaded to sit the RIAI special final examinations to become an MRIAI. Ironically the dedication of the fair was ‘A New World of Tomorrow’ with a guiding theme of ‘a fuller, happy existence for the average man’. A great deal of politics was played out behind the scenes with Ireland being first offered a site with the rest of the British Empire. Pressure was applied by the British who felt that political interests would be best served by the Empire exhibiting as a block rather than scattered over the site at Flushing, New York. After resisting this pressure and more, Ireland eventually acquired one of the best sites on the grounds, thanks to the European Commissioner for the fair, John Hartigan, who was in constant contact with the Taoiseach, Eamon de Valera (1882-1975), informing him of the British position. This pressure and political manoeuvring was reflected in the commissioning of Scott, as both the Architecture Graduate’s Association, and the RIAI favoured an architectural competition to select the design for the building. 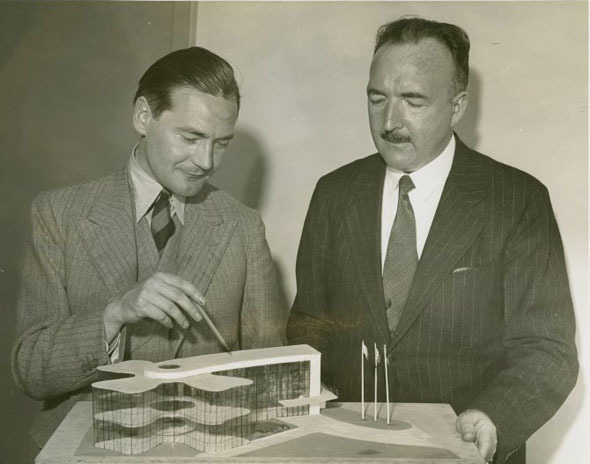 The RIAI wished to send a representative to the Government to promote this idea, and Vincent Kelly proposed Scott. Other members wanted Scott to be accompanied by a representative of the AGA, but this was rejected after pressure from Vincent Kelly. So Scott went alone to the Department of Industry and Commerce in April 1938. Scott was not formally appointed until 10 June 1938 but travelled to New York the next day with a full set of drawings and a model. It seems likely that Kelly and Scott orchestrated Scott’s trip to the Government on his own so that Scott would get the commission – F.H Boland who was Assistant Secretary to the Department was a friend of Scott’s and married to the artist Frances Kelly whose work Scott used at Tullamore Hospital. Vincent Kelly always tried to promote Scott – at one stage he was encouraging him to be the president of the RIAI. 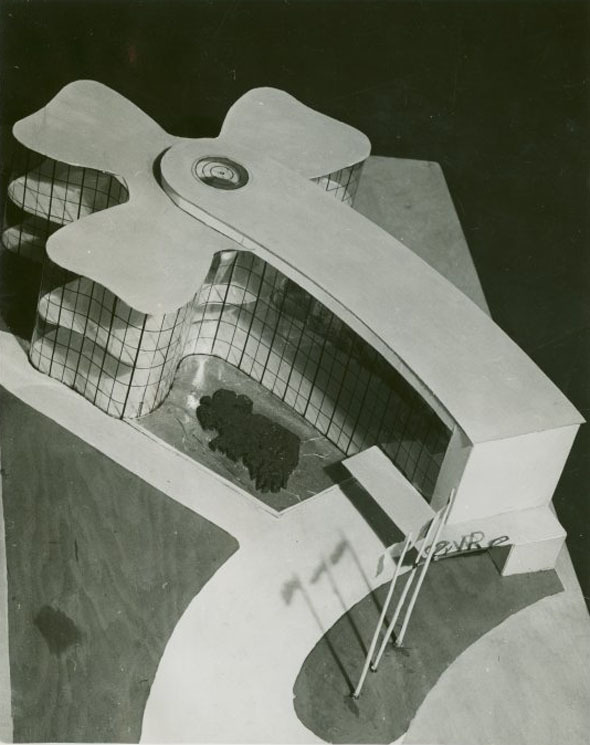 Scott produced a shamrock shaped building constructed in steel, concrete and glass. 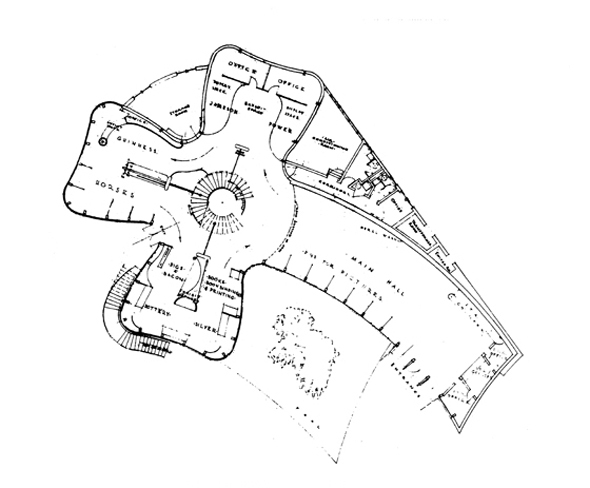 He had played with traditional Irish vernacular architectural styles like beehive huts and thatched buildings until: “The curving organic outline of the building gave it a cosy feel and made it very popular. 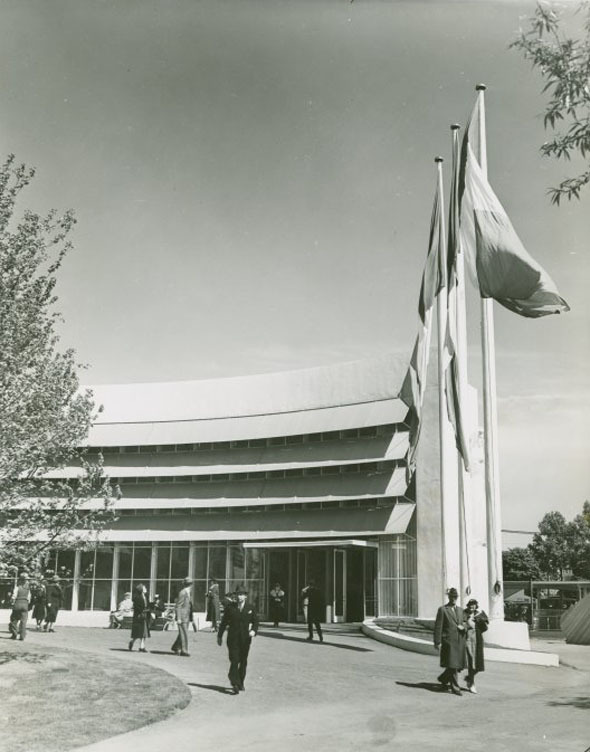 Indeed it was known as the Shamrock Building by the tour buses that toured the fair. Scott though felt that its success was ‘a phoney because he had to use a theme to meet the brief’. He felt that a national style or character was in the use of materials, its function and climate not the external shape of the building. In later years as the use of the shamrock in Irish design became cliched, he was to claim that the plan was forced upon him by a member of the Government. This use of curtain glazing is a fore-runner of the bus station concourse at Busaras. One of Scott’s driving philosophies was the integration of art and architecture. To this end the building was decorated externally with a statue of young woman emerging from the sea (by Professor Frederick Herkner (1902-1986), Professor of Sculpture at the National College of Art) inspired by a line from a W.B. Yeats’ (1865-1939) poem ‘your mother Eire is always young’. This sculpture was the result of a competition organised by the Irish Government although Scott later claimed it was he who held the competition. 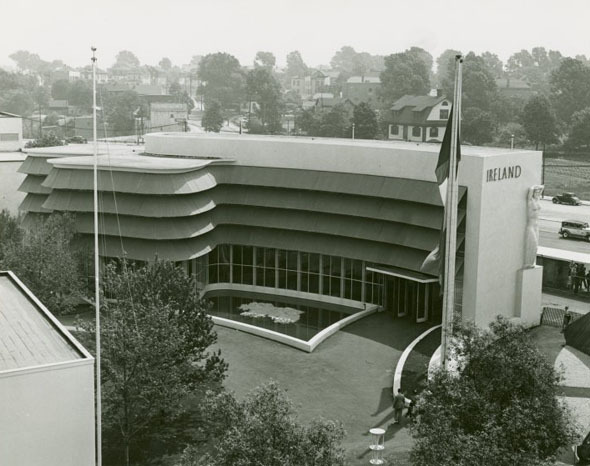 Internally it was decorated with a large mural by Sean Keating depicting elements of Irish life and history. There was also a large oil painting by Maurice MacGonigal celebrating Ireland’s contributions to America’s history and development. Keating disliked Scott – according to Ciaran MacGonigal, Keating ‘hated the sight of him’. Scott gave Keating the commission as a way of hedging his bets and gaining influence and credit with the older generation of Irish artists. 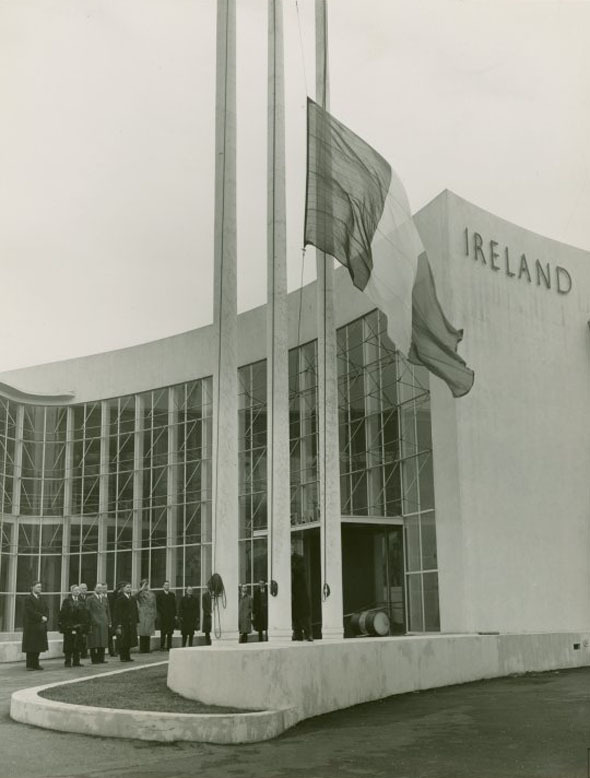 Originally EIRE – the Irish language version of Ireland, was to appear on the building but the Government led by Eamon de Valera decided that IRELAND was more appropriate. EIRE was used in the constitution but was relatively unknown outside of the country. Ireland was used even though Scott would have preferred EIRE as he thought that it looked better as it was almost symmetrical. Scott commissioned the English typographer Eric Gill to design the typeface. Scott also integrated colour into the pavilion. Although the building was largely white in the plaster work and glazing bars, the columns around the doorway were green, and the concrete slab surmounting them was orange thus bringing in the colours of the Irish tricolour. While Scott was not overly nationalistic, he was patriotic and proud of his nationality and heritage. 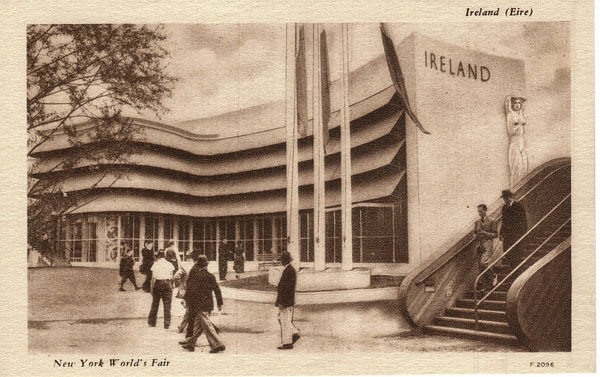 It was also the lead up to the Second World War and the Irish Government would have been keen to promote itself as a sovereign state wholly unconnected to Great Britain in order to maintain its policy of neutrality – this would also have influenced the Government’s desire to have the pavilion as far from the British Empire pavilions as possible.